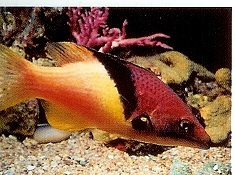 The Coral Hogfish, also known as Eclipse Hogfish or Mesothorax Hogfish. 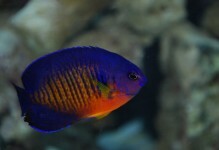 Juveniles are burgundy with yellow spots and as they develop into adults they loose the spots and have a burgundy face with rosy-yellow posterior, separated by a black stripe. 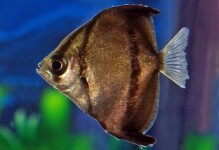 It is a beneficial fish for cleaning parasites off of its tank mates. 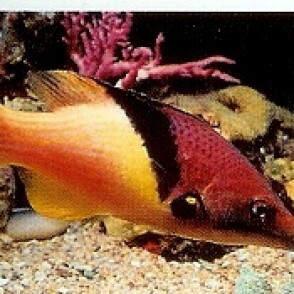 The Coral Hogfish needs to be kept in a 70 gallon or larger fish-only tank, or the reef will become its buffet. 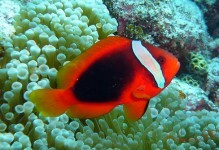 It is aggressive towards smaller, docile fish that are easily bullied. 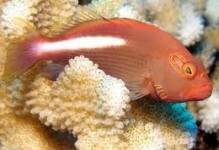 The mature adult Coral Hogfish will eat snails, worms, mussels, small fish, shrimp, and squid.